Should my Business Implement Video Services? 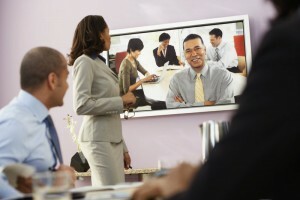 Video conferencing tools add a new dynamic to business meetings. Telecommunication has made it possible for businesses to begin implementing new services for their customers and their business. New technology has made it possible for video services to be implemented through both surveillance and conferencing applications. However, some business owners may be skeptical about these new video services for their business. What these owners fail to realize is how these video services can benefit their business. Video conferencing enables your business team to effectively communicate with each other as well as clients when needed. Instead of taking the money to travel to the client, or struggling to hear and understand each other through a phone call, video conferencing provides an effective and efficient form of communication. By being able to see the clients while speaking, your staff will be able to have a better understanding of their needs, which can only help your business. Video conferencing also works to keep staff in the office instead of wasting time during travel, which can help increase productivity levels. Video surveillance allows you to monitor and protect your business both inside and out. These videos help to catch criminal activity as well as act as a deterrent. Should a situation occur on the property, your video record can help show fault instead of going by hearsay. When criminals see video surveillance systems in place, they tend to pass the business for fear of being caught on tape. Video services can help take your business to the next level through effective communication and new safety standards. This entry was posted on Wednesday, November 4th, 2015	at 5:23 pm	. You can follow any responses to this entry through the RSS 2.0 feed. Both comments and pings are currently closed.